After graduating from Edinburgh University, UK in 1994 with a PhD in pharmacology, Dr Clyne travelled to the USA, where he completed postdoctoral training with Professor Bill Rainey at the University of Texas Southwestern Medical Centre at Dallas. With a keen interest in gene expression and cancer, he joined Hudson Institute of Medical Research in 1998, where he established the Cancer Drug Discovery Laboratory to drive research into novel endocrine therapeutic targets in breast cancer. 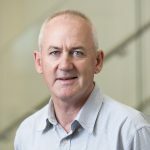 An internationally respected research leader, he has received numerous awards, including an NHMRC Career Development Award, an International Union against Cancer Fellowship, and most recently a prestigious research grant from Worldwide Cancer Research (formerly AICR; Association for International Cancer Research). He has held editorial positions with leading research journals, including Endocrinology and the Journal of Molecular Endocrinology. Dr Clyne’s current research interests include the pharmacology of nuclear receptors and their co-regulators, and the regulation and action of oestrogen in breast cancer. Coulson R, Liew SH, Connelly AA, Yee NS, Deb S, Kumar B, Vargas AC, O’Toole SA, Parslow AC, Poh A, Putoczki T, Morrow RJ, Alorro M, Lazarus KA, Yeap EFW, Walton KL, Harrison CA, Hannan NJ, George AJ, Clyne CD, Ernst M, Allen AM, Chand AL (2017) The angiotensin receptor blocker, Losartan, inhibits mammary tumor development and progression to invasive carcinoma. Oncotarget 8:18640–18656. Zingue S, Nde CBM, Michel T, Ndinteh DT, Tchatchou J, Adamou M, Fernandez X, Fohouo F-NT, Clyne CD, Njamen D (2017) Ethanol-extracted Cameroonian propolis exerts estrogenic effects and alleviates hot flushes in ovariectomized Wistar rats. BMC Complementary and Alternative Medicine 17:65. Aesoy R, Clyne CD, Chand AL (2015) Insights into Orphan Nuclear Receptors as Prognostic Markers and Novel Therapeutic Targets for Breast Cancer. Frontiers in Endocrinology 6:1–11. Nde CBM, Zingue S, Winter E, Creczynski-Pasa TB, Michel T, Fernandez X, Njamen D, Clyne CD (2015) Flavonoids, breast cancer chemopreventive and/or chemotherapeutic agents. Current Med Chem 22:3434–3446. To SQ, Knower KC, Cheung V, Simpson ER, Clyne CD (2015) Transcriptional control of local estrogen formation by aromatase in the breast. The Journal of Steroid Biochemistry and Molecular Biology 145:179–186. Doan TB, Eriksson NA, Graham D, Funder JW, Simpson ER, Kuczek ES, Clyne CD, Leedman PJ, Tilley WD, Fuller PJ, Muscat GE, Clarke CL (2014) Breast cancer prognosis predicted by nuclear receptor-coregulator networks. Molecular Oncology 8:998-1013. Lazarus KA, Brown KA, Young MJ, Zhao Z, Coulson RS, Chand AL, Clyne CD (2014) Conditional overexpression of liver receptor homolog-1 in female mouse mammary epithelium results in altered mammary morphogenesis via the induction of TGF-β. Endocrinology 155:1606-1617. Knower KC, To SQ, Leung YK, Ho SM, Clyne CD (2014) Endocrine disruption of the epigenome: a breast cancer link. Endocrine Related Cancer 21:T33-T55. Epifano F, Genovese S, Fiorito S, Magne Nde CB, Clyne CD (2014) Nelumal A, the active principle of Ligularia nelumbifolia, is a novel aromatase inhibitor. Natural Product Communications 9:823–824. To SQ, Cheung V, Lazarus KA, Knower KC, Clyne CD (2014) Estradiol regulates Tumor Necrosis Factor-α expression and secretion in Estrogen Receptor positive breast cancer cells. Molecular and Cellular Endocrinology 394:21–28. Yang J, Fuller PJ, Morgan J, Shibata H, McDonnell DP, Clyne CD, Young MJ (2014) Use of phage display to identify novel mineralocorticoid receptor-interacting proteins. Molecular Endocrinology 28:1571–1584. Knower KC, Chand AL, Eriksson N, Takagi K, Miki Y, Sasano H, Visvader JE, Lindeman GJ, Funder JW, Fuller PJ, Simpson ER, Tilley WD, Leedman PJ, Graham J, Muscat GE, Clarke CL, Clyne CD (2013) Distinct nuclear receptor expression in stroma adjacent to breast tumors. Breast Cancer Research & Treatment 142:211-223.